Note: Added picture of Joe Biden at Adam Hawker Centre. Problem with upload function prevented me from doing so. In fact i can't type in 'compose' mode & have to resort to 'html' mode to do the blogpost yesterday. I had my first ride by an overseas organiser last year. It was a public holiday- Malaysia Day on 16th Sept 2012, Sunday. Ride day was on 17th, Monday which is a public holiday. 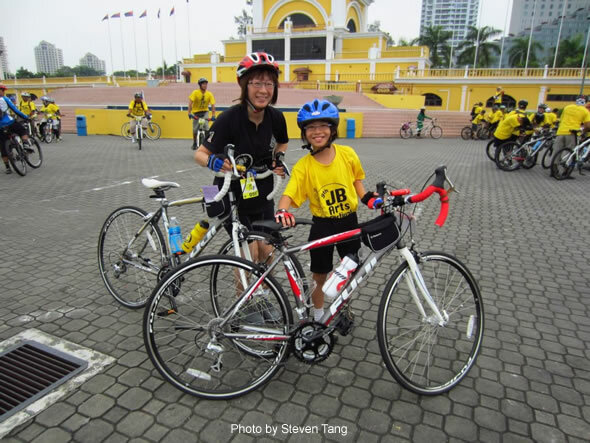 The ride was part of Johor Bahru's Arts Festival & is a 18.8km leisure ride on the roads around downtown JB area. 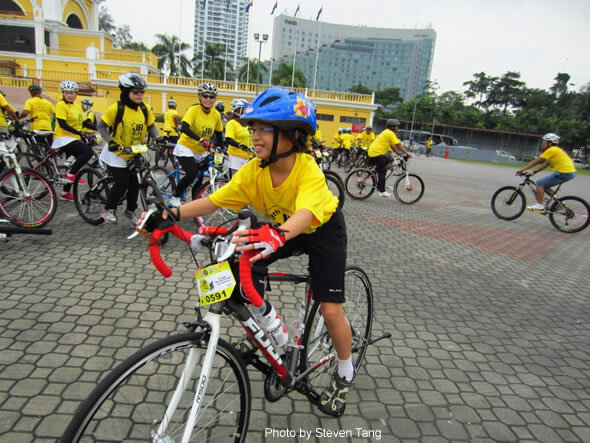 Most Malaysian riders are mostly on fixie bikes (single gear) or entry level mountain bikes. Their currency, the Ringgit has less purchasing power compared to S'pore Dollar & thus generally Msians can't afford better bicycles. This 9 year old(if i'm not mistaken) girl is remarkable in that she is clearly too small for her bicycle. This is how people in less well-off countries make do with fewer $$$ resources. In Sillypore, most parents would buy a kiddy bike & then buy adult size bike when kid is taller. Look at her stretched out arms & legs. She did well on the 18.8km ride though. How come Msians with lesser material possessions are happier than sinkies? How come Msians are more engaged at work compared to 'bochup aka zombie' sinkies at work despite earning less? With her mother at the only rest point along the 18.8km route. How is it that with sinkies buying & buying, piling & piling more material possessions, so many sinkies are unhappy? So stressed & strapped for time? Where's the progress in that? By buying & consuming more stuff? Isn't it time to stop the fetishism on chasing GDP growth & start pursuing happiness instead? 1 way to start is to change via the election, the govt leaders stuck in the doctrine of grow GDP at all costs like cancer. The following video shares your point about consumerism. That said, parents buying children their own kiddy bicycles that fit their size may be about safety rather than being spendthrift. If the child cannot touch the ground on tip-toe while sitting on the bike seat, then the bicycle is not safe for the child. Thanks for the 'knock' with that youtube video. Is in my bookmarks which i've haven't gotten around to writing more on materialism. All these while have been using localised examples to wake people up. I posed question after question to wake those 'sleeping' locals. Is quite a tragedy in be stuck in work-spend/buy treadmill thinking buying this & that will numb their unhappiness at work/life. You have been through this stage while in SG. When is time to move to CA, you realise all those possessions don't matter a lot. Is memories such as photos that you cherish & bring along to CA. Price of materialism is too high in SG. That's why i advocate booting the overly materialistic ruling party out in 2016 polls.